Sometimes a noisy, bustling metropolis really hits the spot, but there are times I long to have completely empty streets all to myself. Which is one reason I love this serene and peaceful (or perhaps “post-apocalyptic,” depending on your half-full/half-empty world-view) scene of Dallas, totally deserted save for a partial view of a single car in the distance. The brand new “triple underpass” was unveiled in 1936, the year Dallas was obsessed with showing off what a fantastically modern city it was to the throngs of visitors flooding in for the Texas Centennial celebrations. G.B. Dealey himself rode the first car through the underpass. Perhaps that’s his little car heading up Main Street. 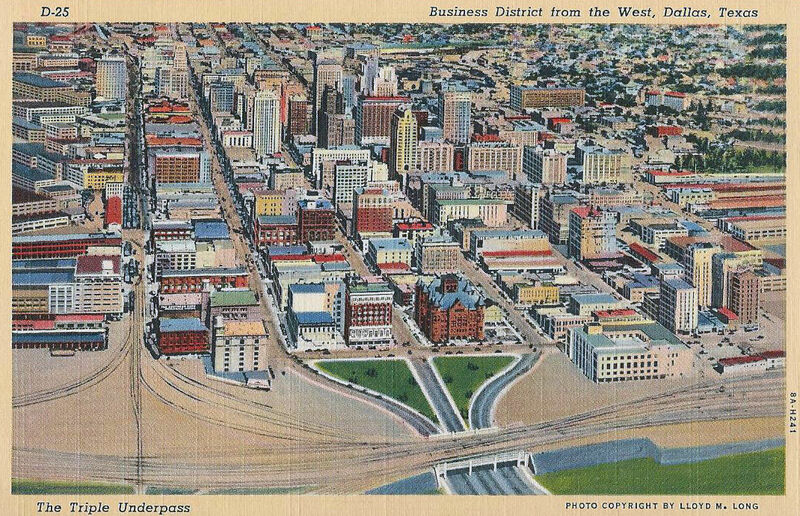 Above, the “Business District, from the West.” Note the absence of Dealey Plaza, which wouldn’t be completed until 1941 and not officially named “Dealey Plaza” until 1946. …After that, the place wasn’t thought about in any especially significant way until 1963. “The Gateway to Dallas, Texas,” with beautiful Dealey Plaza now set in place, one day to become the most-visited historic site in the city. Despite its grim connection to the assassination, every time I drive through that underpass I always get a little thrill. Almost 80 years after it became a landmark, the triple underpass is still a remarkably cool piece of Dallas architecture and engineering. For a nice, concise overview of the history of the triple underpass and Dealey Plaza, check out the Sixth Floor Museum site here.